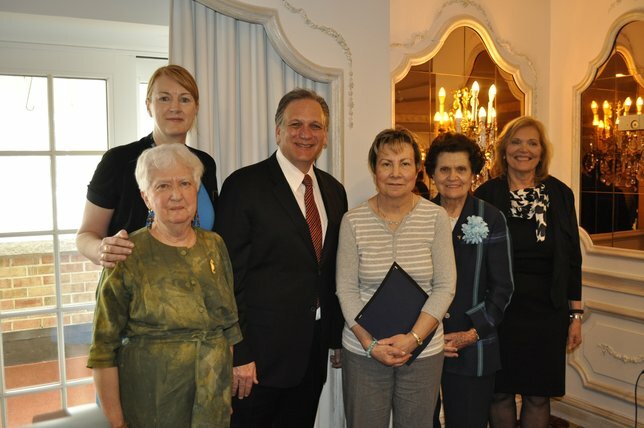 Nassau County Executive Ed Mangano presented EAC Network’s Meals on Wheels volunteers with special citations from Nassau County for their charitable work during a volunteer recognition luncheon at the Garden City Hotel on April 22nd. Meals on Wheels delivers nutritional meals to local seniors who cannot shop or cook for themselves. Garden City, NY - April 27, 2016 - Nassau County Executive Ed Mangano presented EAC Network’s Meals on Wheels volunteers with special citations from Nassau County for their charitable work during a volunteer recognition luncheon at the Garden City Hotel on April 22nd. The luncheon served as a celebration of the volunteers’ steadfast dedication to delivering nutritional meals to isolated seniors. Mr. Mangano offered extra recognition to those that have volunteered with Meals on Wheels for over 30 years. Program Co-Director, Mary Coyle, expressed her appreciation for the volunteers and the impact they have on our local seniors. Meals on Wheel volunteer, Kevin O’Neil, recounted his experience with a meals recipient he visits every Monday. All volunteers from EAC Network’s Meals on Wheels program received citations for donating their time and mileage to reach seniors in need. The appreciation luncheon was made possible due to the generosity of the Feil Family Foundation. Meals on Wheels delivers nutritional meals to local seniors who cannot shop and cook for themselves. To learn more about EAC Network’s Meals on Wheels program visit us here or call 516-539-0150 x219. EAC Network is a diverse social service agency that empowers, assists, and cares for people in need across Long Island and New York City. Our mission is to respond to human needs with programs and services that protect children, promote healthy families and communities, help seniors, and empower individuals to take control of their lives. For more information about EAC Network, please call 516-539-0150 or visit www.eac-network.org, Facebook, and Twitter. Subject: LongIsland.com - Your Name sent you Article details of "Nassau County Executive Ed Mangano Awards Meals on Wheels Volunteers with Citations"